Google announced two big new messaging apps today -- Allo and Duo -- for better experiences with text conversations and video chats, respectively. The apps each have some interesting features that make them stand out, but it was a bit curious what these new additions would mean for Google's Hangouts and Messenger apps. A new report says that the new additions to Google's app roster will mean nothing for Hangouts and Messenger. Supposedly, Google has confirmed that all four apps will coexist peacefully. Google said that it will continue to invest in Hangouts and keep it separate. This does make sense, because while Allo looks interesting, it is more in the model of WhatsApp -- an internet-based messaging system tied to your phone number, but doesn't handle SMS. Now, this doesn't necessarily mean that all of the apps will remain separate forever. 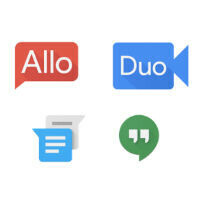 Given that Hangouts does web chats in addition to SMS handling and can do video chats as well, it doesn't make a whole lot of sense to have Allo and Duo splitting the market. Depending on adoption, we still wouldn't be surprised to see a merge in a year or two, or for Hangouts to disappear and give way to Messenger for SMS and Allo for instant messaging. Why don't they just integrate it to Hangouts instead of separating into so many apps? I really hope that they won't baked into GMS service and not allow to uninstalled. Hangouts will remain standalone app due to it's unique features. My guess for why google is doing this. 1. Phone call - free to us, canada and low rates for rest of world. 2. Group video calls - for work related stuff. 3. Integrated into gmail, google plus. Will I use allo or duo? Not likely. May be install it, keep it for few days then uninstall it. Whatsapp is about to introduce video chat...after that all other video chat apps will see decline in active users. Wish they would make this into a standard messaging app I find it impossible to get people to sign up for these things then it's only me and a few other people using it so it's pointless. Hope google graveyard still have enough space to contaim them?hangout is already struggling and begging for recognition. All that google had to do...enable hangouts to login with phone number instead of gmail account. Text & video chat improvements will eventually come to hangouts. https://www.youtube.com/watch?v=QJ3WV8N92Hs This video goes against what's in this article. I spent years trying to convince people to use Hangouts because I hate Facebook and whatapp, such horrible design and reliance on a phone number, and I finally made some traction.. Than this! I have to say, both Allo and Duo look amazing, finally some serious data communication stuff. But why couldn't they just update Hangouts with all the new features, doesn't seem like anything up there required it's own app away from Hangouts. There is already app in playstore Allo by Allo.im, what is there future?